Have I told you a few people at my work call me the “avocado lady”? Yes, I am known as the girl who always has an avocado on hand. Rightfully so, since I can easily consume three avocados a day. I’m trying to wean myself off of eating so many avocados lately, you know, to help the wallet out. But if there is anyone who can rival my love for avocados, and guacamole in particular, it’s my friend and old coworker Jen. To say Jen has an obsession with chips and guacamole is an understatement. Anytime we ordered dinner during tax season at work (so everyday for 3 months straight), Jen would order chips and guacamole if it was on the menu. If it wasn’t, there was a good chance we were going to Chipotle to get some. So when Jen’s birthday came around this year and I knew I wouldn’t be see her since I started my new job, I knew I wanted to get her some chips and guacamole. But not just any chips and guac, they had to be sugar cookies shaped like chips and guacamole. Next on Jen’s list of food favorites are my sugar cookies (Barq’s Root Beer actually may be one spot ahead of my sugar cookies, the jury is still out). So I figured, why not combine two of her favorites into one special birthday surprise! These chips and guacamole shaped sugar cookies are definitely my new favorite cookie design. They may take quite a few steps but the design overall is fairly easy. I didn’t even end up using a cookie cutter – I just used a pizza cutter to make all of my shapes! My favorite part of these cookies is the bowl of guacamole. I channeled my inner Mrs. Fields and made a cookie cup out of the sugar cookie dough using a muffin tin, and then stuffed it with green colored frosting. I added some green sprinkles for cilantro and some small red cookies for tomatoes to make it more apparent that it was guacamole. I was giddy with excitement before, during, and after making these cookies and was so sad I could not tell Jen about them until she received them! It’s so hard to keep a good secret! No that's not real guacamole you see! These gluten-free chips and guac sugar cookies are made to look like the real thing! In a medium bowl, whisk together brown rice flour, white rice flour, potato starch, tapioca flour, cornstarch and xanthan gum. Set aside. Gradually add in flour (1/2 cup at a time) and mix after each addition. Put dough in the refrigerator for an hour or so, or until the dough firms up. Sprinkle your work surface and rolling pin with powdered sugar. Roll the dough out to a 1/4 inch thickness. Using a pizza cutter, cut triangles into the dough (or use a triangle cookie cutter). Cut a few small rectangles for the tomatoes (about 2-3). Place triangles and rectangles on a greased cookie sheet and put back in the freezer for 10-15 minutes. To make the bowl for the guacamole, press 3 tbsp of cookie dough into a muffin tin. Then, bake triangles, rectangles and cookie cup in the oven at 375 degrees Fahrenheit for 8-10 minutes or until cooked all the way through. The cookies should not brown completely, but the edges can be slightly browned (that’s a good indication it’s done). Cool on a wire rack. In a bowl of an electric mixer fitted with the whisk attachment, combine the powdered sugar, meringue powder and water. Mix for 7-10 minutes, until the ingredients are well blended and the icing has a matte finish. This is the base consistency. I usually add about 1 tsp more of water for a good outline icing (I use a 10 second rule) and add more water until I reach a 4-second icing for flood icing. This means that when you drizzle icing over the bowl of royal icing then the icing will flow back in with the rest of the icing in 4 seconds (10 second icing is the same but it will sink back in with the rest of the icing in 10 seconds). If you need to thin it out more then add more water. If you need to thicken it add more powdered sugar. Mix a few drops of green icing with the white canned frosting. Mix in some green sprinkles and the red tomato cookies when they're ready (see below). 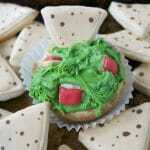 Outline the triangle cookie using ivory icing (10 second icing). Flood with thinned out ivory icing (4 second icing). Immediately after flooding with the ivory, using the brown icing (4 second icing) in pastry bags fitted with a number 3 tip (or squeeze bottles – they work wonders), make small dots by squeezing the bag gently and quickly. Let dry. Outline the small rectangle cookies in red icing (10 second icing). Let dry. Fill with red flood icing (4 second icing). To assemble guacamole bowl, spoon green frosting into the cookie up. Place red rectangle cookies into the frosting.